The Overland Telegraph Line - a cable link to a hub in NT/Queensland. Planning for the cable from Indonesia to Australia involved selecting a suitable site probably on the northern coast of Australia. This selection involved (surprisingly!!!) both technical considerations and political considerations. It was impossible to select a single site which would best serve all interests. The diverse nature of the Australian geography meant that long lines would have to be constructed somewhere. If the north of Australia were considered to be more desirable than the west or even all the way by submarine cable to New South Wales, then should the landing be in the Northern Territory of South Australia or somewhere in Queensland? Report of the General Superintendent of Electric Telegraph ... for the year ending 31 December 1865, p. 15. 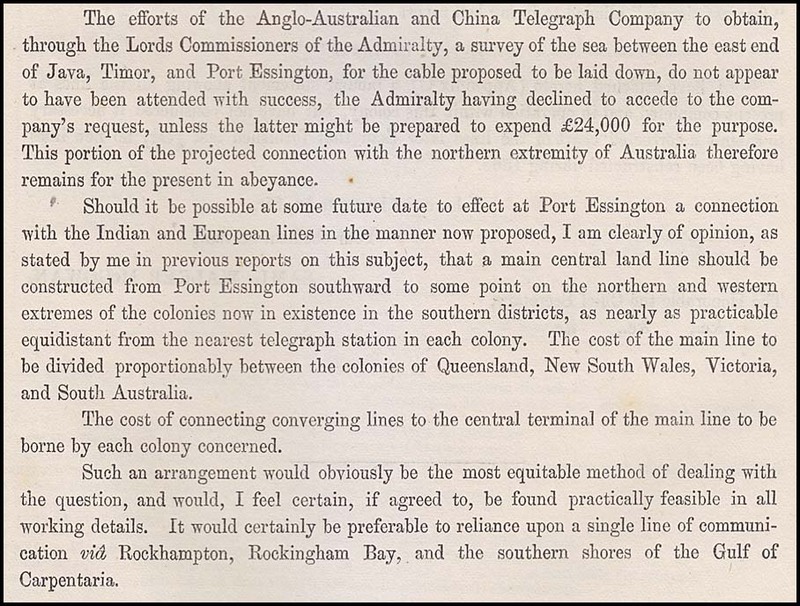 He reiterated his call for the "central hub" concept in his 1866 Report as well as his call to extend a line to King George's Sound in Western Australia. Main page for the Overland Telegraph Line.